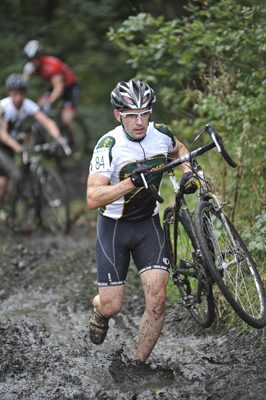 There were murky grey conditions early in the morning at Bogart Hole Clough in Manchester to greet racers with the going a little soft and wet in places for the Manchester Wheelers Cyclo-Cross Race, Race 5 in the North West League. 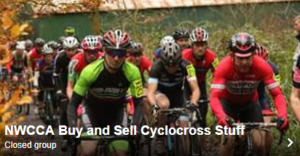 But with a DJ spinning some of our favourite tunes, Ian Bury’s knowledgeable and sometimes cheeky commentating, and some warm Autumn sunshine, we had a great setting for an afternoon of top cross racing on one of the North West’s most highly rated courses. On to the real stars of the show, the main race had a strong turn-out of 111 – pretty good since we were sandwiched between Rapha’s Supacross promotions at Windermere on Saturday and across the Pennines on Sunday – and had the riders facing a classic cross course of jump boards on the top field, some tarmac to spin out the legs, some tough off camber grass and slippery rooty sections with one ‘brutal’ tarmac climb, steps, ride-able or running banks depending on your ability and an extra loop thrown in for good measure. Tom Armstrong (Herbalife/Wheelbase) and Giles Drake (Team Elite) pulled clear of Paul Bethell (Team Elite) in the early stages of the race and were stuck together for two thirds of eight laps until Giles broke his rear mech and had to run half of the course, giving Tom a well earned win after his racing in the Elite race at Rapha’s gig on Saturday. 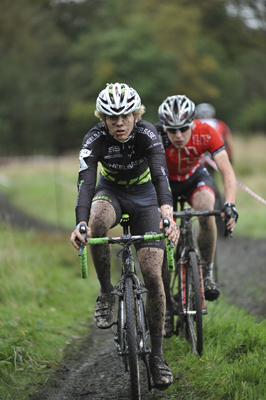 Tom’s still a junior and is looking stronger and stronger each race – a fast emerging talent. Meanwhile Paul Bethell pulled clear to take second ahead of Martin Woffinden (Cycle Sport Pendle), also the first Under 23, with a great race for Pete Middleton (Zepnat) seeing the current North West Veteran Champ take fourth overall. 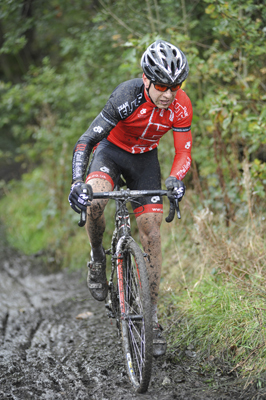 Rob Smail (Cycle Premier) is now a regular force on the cross scene and took fifth place. Giles eventually finished a creditable 7th and got some useful if uninvited running practice in. 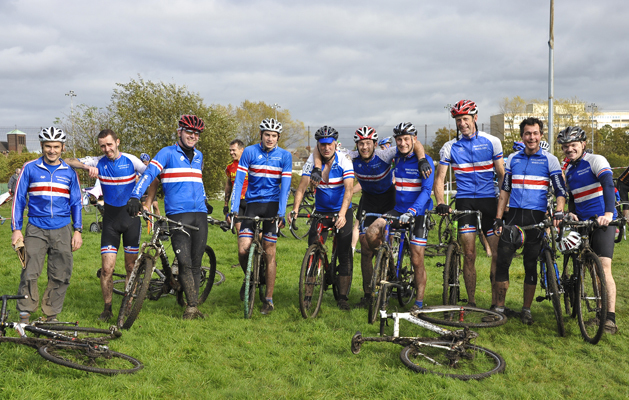 Other notable rides were the winning Vet50+ rider, Roy Hunt (Dutch Wolf) and first woman home Becky Preece (Red Rose Olympic) outsprinting Anna Buik from Thetford MTB. And let’s hear it for promoting club’s (Manchester Wheelers) 10 riders all finishing, most of whom had been setting up the course with me at 8am! In the Under 12’s, Alistair Leivers (BYCA) took the win from Nathan Hawthorn (Cyclesport Pendle) and Sol Kerfoot Robson (Rhos-on –sea). Kim Baptista (Eastlands Velo) was first girl over the line at 9th overall. The whole under 12’s field went barmy when some Haribo and Mars Bars were offered up as additional prizes to all the finishers. Dylan Kerfoot-Robson (Rhos-on-sea) won the Youth Race over three laps of the main course despite an early challenge from Robert Armstrong (Bill Nickson/Raleigh). First girl home was Jess Wilkinson (Birkenhead North End) looking good at 5th place overall. Additional prizes were provided by Champion System/Maxgear, and Sports Sunday and Ed Rollason were on hand to capture some of the action – www.sportsunday.co.uk, www.edrollasonphotography.co.uk.